Try a new experience of Salesforce development that can be easily scaled throughout your team with no interference! Looking for an IDE for Salesforce Development? 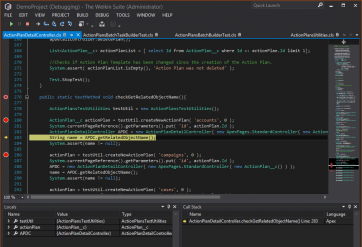 The Welkin Suite provides a rich set of handy time-savers, debugging and unit test features out of the box. Each of them is designed to boost your productivity, either its purpose is just to record the history of changes or to catch all the bugs in code and get everything done in only a few clicks. Use these features in a complex and get the unique benefits! Executed one by one, these tools helps you to finalize your code and give no chance to bugs. Step to the new level of Force.com development with The Welkin Suite! Do you know that you can integrate MavensMate and The Welkin Suite with the help of a few simple steps that take only a couple of minutes? Create Apex classes and objects, execute queries, run tests and much more — in a single workspace for both tools. Our mission is to “TWS” Salesforce Development: Turn frustration into comfort, Work smarter not harder, Save time at every corner. We aim at making your workflow as convenient and hassle-free as it can be. Thus, The Welkin Suite is not just a development environment — it is an actual development ecosystem that evolves together with Salesforce. Are you concerned about the issues that may occur when migrating from MavensMate to The Welkin Suite? No worries! You will only spend about 15 minutes to migrate — but it will save you hours once you try The Welkin Suite's cool features. Out of the box, The Welkin Suite IDE provides a unique feature set to considerably improve your development comfort and productivity. Use these tools in a complex to reach your goals. Enjoy the cozy UI where all the features are at hand. When working with the code, it is essential to have an ability to track the changes made to the files. 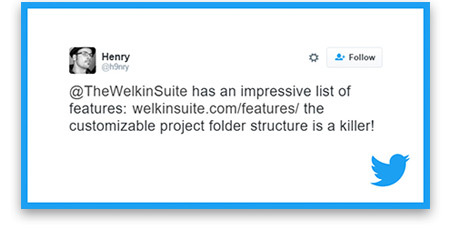 The Welkin Suite automatically creates the versions of the files after building, pulling, or deploying a project, as well as upon creating a file, moving it, deleting, etc. This way you can restore these versions if needed; you can also compare the versions of the files, and trace when and which changes were made. Once you are done coding, it is best to devote a few minutes to quickly revise its performance and security. Run your tests as many times as you need with a single click, and The Welkin suite will give you all the necessary information about the execution time, along with other details. Use this handy feature to polish your code and make sure that it works nice and clean! all of these tasks — all within a single IDE! 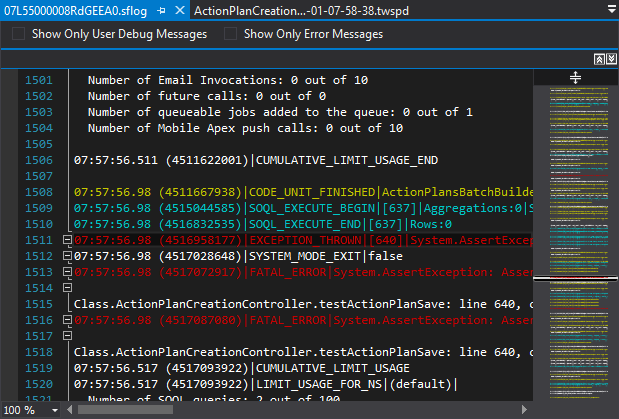 Have a better understanding of what happens on your org, and make your development process clearer by analyzing the Debug Logs within The Welkin Suite IDE. Our tool provides you with the maximum amount of useful information from the logs by highlighting different events, and allows you to filter entries, and much more. Dig into the logs to catch every bug! The Welkin Suite helps you realize how your code works in reality, especially when time is of the essence. With this feature, you can trace the execution process, all methods and constructors calls, initialization and value assigned to variables, including objects with lists. Watch all the calls and operations being executed step-by-step to quickly detect and fix all the problem spots. An ability to conveniently run tests and monitor results is critical for a high-quality of Force.com development. 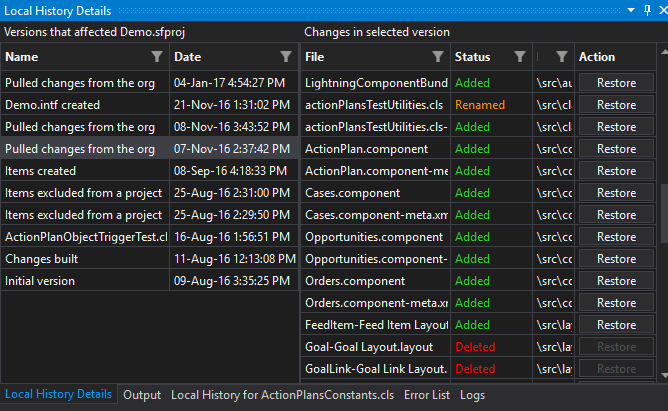 The Welkin Suite IDE shows you all the information about the tests in real time: currently running, completed, failed tests, and related data. 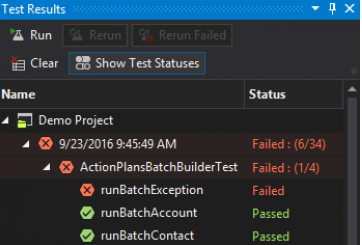 Run tests, monitor the execution process, and investigate the failures while working in the IDE! Watch the short 2-minute demo! The Welkin Suite IDE in a nutshell. © 2017 The Welkin Suite. All rights reserved. 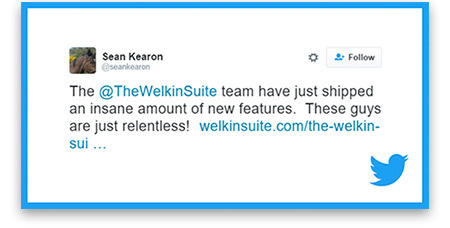 Get started with The Welkin Suite today! 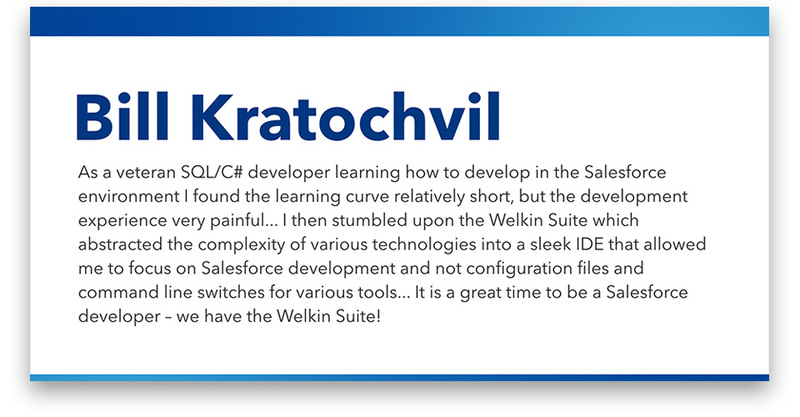 The Welkin Suite offers you the full set of cutting-edge features for Salesforce development. Choose the pricing plan that fits your needs best, or give The Welkin Suite a try with a Free 30-day Trial period!